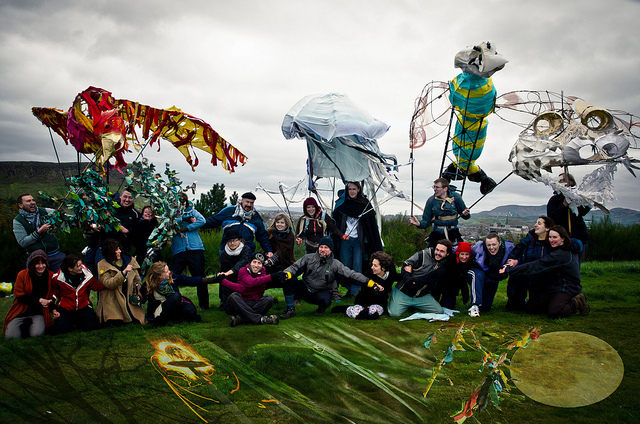 Nyree McAleer shares her experiences as a Group Organiser for Beltane and Samhuinn Fire Festivals. Then someone next to me lit my brand (those were the days of carrying half a small tree, not the beautiful custom made brands we have now). It took every inch of my being to stop me jumping up and down with joy, right there on the Acropolis. The rest of the night is a blur of faces and happiness, but I do remember I was totally entranced with the two White Women that I spent the night walking beside. (Both of whom I became very good friends with; one I co -GO’d White with for two years and the other became my ‘eyes’ on a future night that I was the Caillech). That night, with fire on a stick, I vowed that the following year I would be wearing White. I was part of the Summer Court for Samhuinn that year, the first time I had gone the ‘whole process of turning up to an Open Meeting and signing up for a group. That Samhuinn cemented my dislike of artificial fabrics and Fairy wings (it is shocking how quickly those things go up when next to a naked flame! Thank goodness no-one was hurt). The following year I turned up for the Beltane Open Meeting and put my name down for White. Oh my, that was one of the scariest experiences of my life! I didn’t think I would be accepted as it was only my first attempt at applying for White and my second ever Beltane. I returned to ‘active duty’ last year and co-GO’d the Elementals at Beltane – Wow, weren’t the puppets STUNNING! The guys all worked their socks off and it showed on the night. I still crack a smile every time I see pictures of them. And those puppets became big personalities in their own right. I have had the honour and pleasure to work with some talented and beautiful individuals over the years; too many to mention here and some of whom are still part of our Society today (you all know who you are!) and I don’t regret a second of it. In fact, I treasure every memory, every moment. If I can leave you one piece of advice, it is this; don’t be scared of doing something out of your comfort zone. If you are passionate about a group or character – then get your GO application in! NOW!!!! Don’t assume someone else will do it. You CAN DO IT!!! BFS needs you, needs your passion, your vision, your spirit and your talent. Being a GO will break your heart at times and yet restore your soul. And it is the greatest gift you can give back to the community that you are part of. So in whatever guise you will be in at this year’s Beltane; I look forward to entertaining you/working with you/being a colleague/serving you. What an amazing review, wish I had been there!